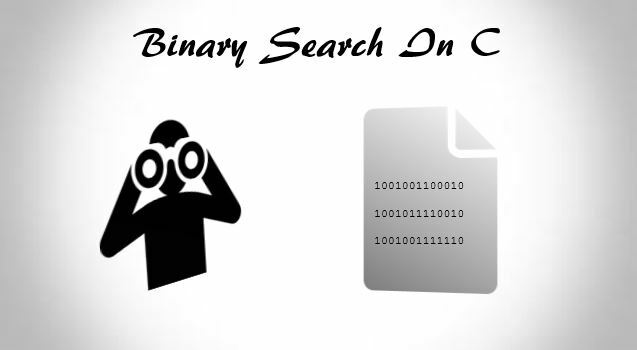 In this article, you will learn the concept of binary search in C programming using arrays. We have discussed two ways of searching an array. The linear searching method works well with small and unsorted arrays. This process is slow and inefficient. Thus, we are going to learn high-speed binary search technique. Binary search in C programming locates the middle element of the array and compares the search value. If they are equal, it displays the subscript of that element, otherwise, the search is reduced to one-half. If the search value is less than middle value of the array, the first half is searched, otherwise, the second half is searched. This continues until the search value is equal to the middle value of the array or until the search value is not found. How binary search in C programming works? Let’s locate 18 in the following figure. It only takes 3 comparisons to find 18 which is much faster than other algorithms. In a worst-case scenario, searching an array of 1023 elements takes only 10 comparisons using this method. At first, it will divide 1024 by 2 giving 512 and then repeatedly dividing yields 256, 128, 64, 32, 16, 8, 4, 2 and 1. In the above program, we have generated multiples of 2 up to 14 in an array data . There is a user-defined function binarySearch() for searching the array that takes four arguments. In this program, only 3 comparisons are required to find the search value which is demonstrated above.